However, the procedure is not fool-proof, as there’s the inherent market risk of holding onto the position, even for a short time. If the markets are volatile, the position could move against you, eliminating any savings from doing the conversion this way. 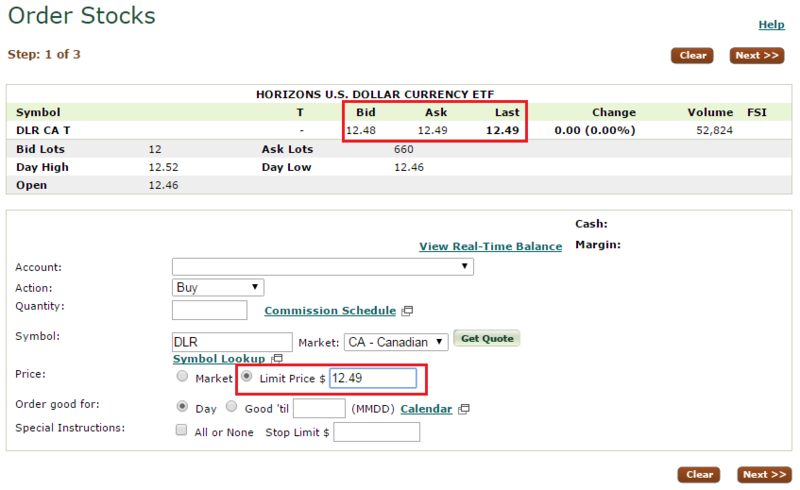 DLR is specifically designed  to track the current USD-CAD spot rate at 10x the current rate. So, for example, if the current spot bid/ask is 1.26752/1.26790, the bid/ask of DLR might be around 12.66/12.68 or so. DLR.U, being denominated in USD, is mostly static. The bid/ask might vary from 9.98/9.99 to 9.99/10.01. 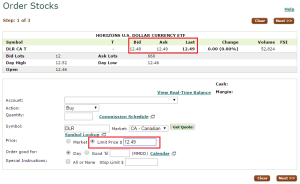 Buy DLR in your CAD account. 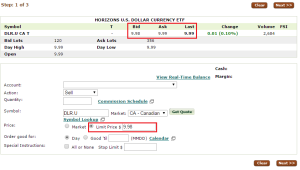 Wait for the trade to settle, then call your broker to transfer/journal the shares over to your USD account. This will allow you to sell them as DLR.U. You’ll now have USD in your USD account, to buy US securities with, or to withdraw/transfer to another account, or for whatever reason. I put in a limit order @12.49 and was filled immediately. I initially called up my broker (TD Waterhouse) and attempted to transfer the shares over to my USD account, but was told I had to wait for the trade to settle, which would be on Friday. After that, the USD cash was in my account. 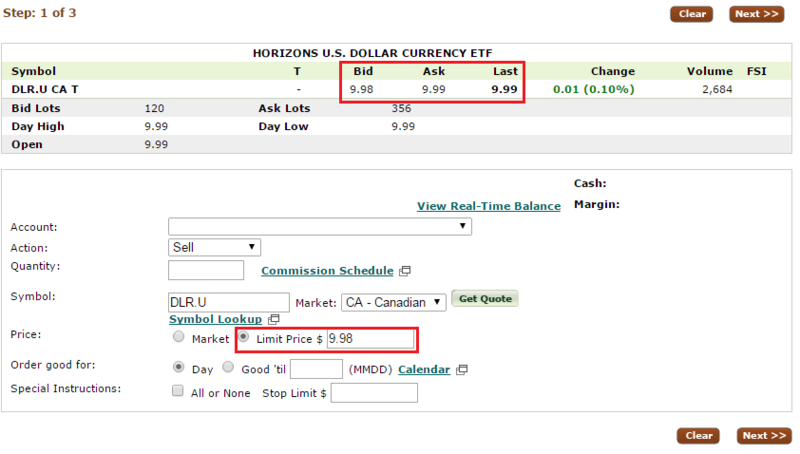 The total cost of this transaction was essentially two trade commissions (one at $9.99 CAD and one at $9.99 USD) plus the bid-ask spread on DLR/DLR.U. Clearly, there is an amount above which converting using this method is superior to using a bank’s quoted rates, and below which the bank’s rates are better. This method is only worth the effort for converting over large (>$5,000-$10,000 CAD) amounts of money. You should calculate the break-even point. This takes time – at least three days for the trade to settle plus maybe another to transfer from your CAD to USD brokerage account. Because of the time taken to settle+transfer, I’d try to do the trade on a Monday so you can close it out before the end of the week and avoid holding over the weekend. That will save you a very, very small amount in management fees from holding the ETF an extra two days. I’d avoid doing this on volatile days in the market. For example, avoid BoC rate announcement dates, as not only may the price be moving fast but the bid/ask spreads will likely be wider. Reading their prospectus, it appears they do this simply “by investing primarily in cash and Cash Equivalents that are denominated in the U.S. dollar.” There’s also this statement that “Horizons DLR is a money market fund within the definition set out in National Instrument 81-102”, so it appears to be more-or-less a money market fund that holds US-denominated instruments. It’s not the same when going from USD to CAD because you’d be buying DLR.U, waiting for the trade to settle, transferring over to your CAD account and then disposing of DLR shares. During that time, the price of DLR could have fluctuated. Microsoft’s bid to buy Yahoo!